Buttermilk Biscuits recipe by SumeraNawed at PakiRecipes.com. 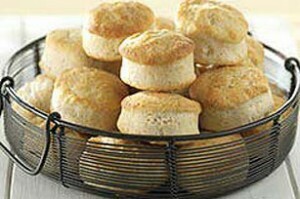 These tender, old-fashioned biscuits are low in fat and flavored with buttermilk and butter etc. In a bowl combine the flour,baking powder,baking soda and salt . Stir in enough buttermilk just to moisten dough. Turn onto a lightly floured surface,knead 3-4 times. Pat or roll to 3/4 in thickness. Cut with a floured 2-1/2 inch biscuit cutter. Place on a baking sheet coated with nonstick cooking spray. Bake at 450 degree for 12-15 minutes or until golden brown. Serve hot with tea or salad or as a side with bar.b.q chicken .